Leaves on a homegrown hop plant. 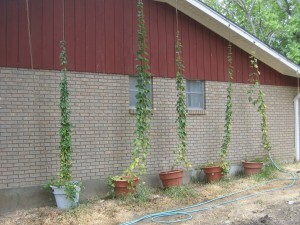 Growing your own hops is a rewarding experience for any homebrewer. The bines are easy to grow, beautiful and can add a nice decorative touch to your house. (Hop vines are a particular type of vine called a bine.) 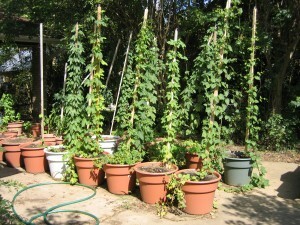 Plus, growing hops gives many brewers a feeling of being a little closer to their hobby. And, most importantly, homegrown hops supply you with an ingredient for your homebrews. 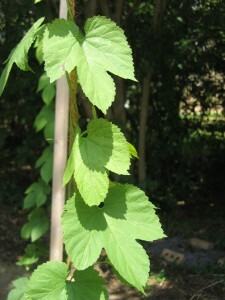 Some online sources, however, give home hop growers bad advice when it comes to using homegrown hops. Many times, you will hear people warn growers off using homegrown hops because the alpha acid levels are unknown. These people will say you should only use them for dry hopping or late hopping. This is ridiculous. You have an ingredient that you grew yourself; it could not be fresher — use it! First year hops growing up the side of a house. Hop varieties have a typical alpha acid range and you can simply pick a midpoint value for a ballpark estimate of your homegrown hops alpha acid content. If you really feel the need to narrow things down, brew a small batch of beer with only one (bittering) addition of hops and taste it to estimate the level of IBUs. Then you can go to your homebrew recipe calculator and figure out what the alpha level would had to have been to yield a beer of that IBUs. Your estimate will only be as good as your palate, but you should be able to get an estimate that is accurate to within a percentage point . You certainly can use your homegrown hops for dry hopping or late additions, but don’t let anyone talk you out of using the cones you grew yourself as bittering hops. The point of brewing is to make great beer, not to generate an estimate of IBUs. Home being grown on containers, using an adjustable trellis. I love reading these articles because they’re short but inifamrtove.